What are those dark gray lines on the border of carpeted rooms? If you have light colored carpet, you have probably noticed these dark lines that appear on the edge of the carpet. These black edges are known as filtration soiling because as air passes through the carpet this microscopic soil is “filtered” out and left in the carpet (hence the name filtration). 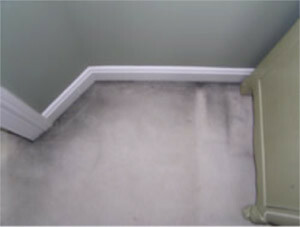 Over a significant period of time this soil builds up in areas where air is able to pass through the carpet, most commonly around the border of carpeted rooms and under doorways causing black edges.